Nematodes are one of the most diverse phylum with over 28,000 discovered many of which are parasitic. Red Stomach Worm is a very common parasite and one of the most pathogenic nematode of ruminants. The Red Stomach Worm does not have a complex respiratory system. 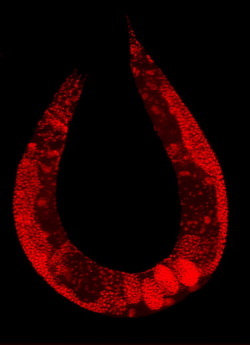 The respiration of Red Stomach Worms is diffusion. Roundworms are a free-living, transparent nematode , about 1 mm in length, which lives in temperate soil environments. Like Red Stomach Worms, the Roundworms do not have a complex Respiration System. Roundworm respiration is also done through diffusion. A Heartworm is a parasitic roundworm that is spread from host to host through the bites of mosquitoes. The heartworm is a type of filaria, a small thread-like worm. Again, the heartworm is like the Red Stomach Worm and Roundworm, they do not have a Complex Respiration System. They too perform respiration through diffusion.